In 2011, Lea Schell graduated from the Central Tech Practical Nursing program on the Sapulpa campus, and after passing her boards, she started the LPN to Registered Nurse bridge program through Tulsa Community College. The Central Tech Practical Nursing program is a full-time course offered on both the Drumright and Sapulpa campuses. Students learn how to administer medications and treatments as prescribed under the supervision of a registered nurse, licensed physician, or dentist. In the self-paced practical nursing program students spend 672 hours in clinical rotation and 791 hours in classroom theory and lab. “Central Tech fit my schedule. It allowed me to continue to work while I went to school,” Schell said. Before enrolling at Central Tech, Schell was a scrub tech in labor and delivery, and during her practical nursing program she continued to work in a clinic as a scrub tech. Coming from a medical background or starting with no experience, the practical nursing program gives you the tools and abilities needed to succeed in the workforce or continue on with more education, Schell said. In April 2014, Cox was in the waiting room with friends and family as her first grandchild was being delivered. After helping in the delivery, Schell realized it was Cox who she wanted to pin her at the RN graduation. To learn more about the Practical Nursing program visit the free health fair on the Drumright and Sapulpa campus during the 45th Central Tech Open House on Sunday, February 15 from 1-4pm. 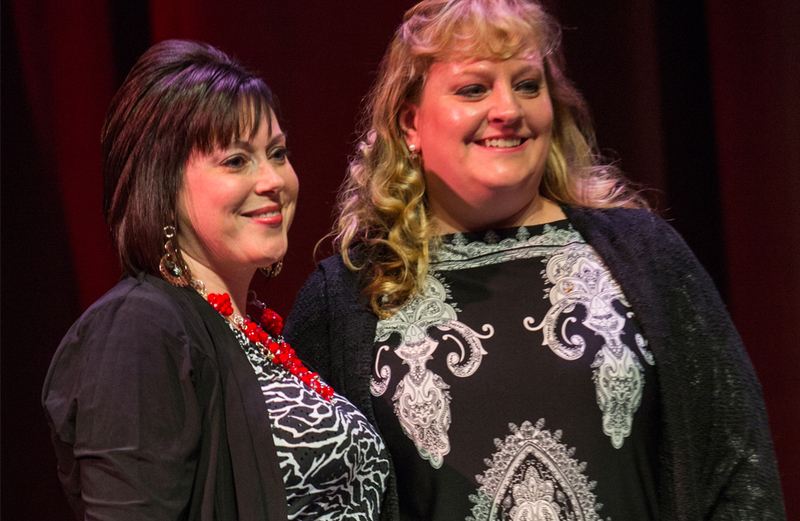 (Left) Ann Cox, Central Tech Practical Nursing instructor stands with (Right) Lea Schell on stage during the Tulsa Community College Registered Nursing pinning ceremony in Tulsa, Okla. on Dec. 18, 2014.